A religious protester has stabbed three people taking part in an annual gay pride parade in Jerusalem. The attack happened as hundreds of scantily-clad revellers danced and kissed their way through the city. Israeli police arrested a suspect, and the victims - a man and two women - were taken to hospital. A Jerusalem court lifted a ban on the parade by the city council, which warned the event would be "provocative" and set off unrest. Jewish, Muslim and Christian leaders in the city had protested against the march. At the entrance to the city, protesters erected a banner that read "Welcome to Sodom", while opponents set off a stink bomb at the parade's starting point. The march continued despite the violence. 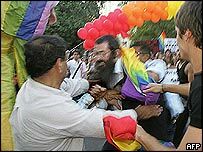 "It took many years for Jerusalem to have the gay pride parade," participant Moshik Toledano, 39, told AP news agency, "but once it happens it makes no difference if the ultra-Orthodox come here and try to stop it."